Clayoquot Plateau Provincial Park on the west coast of Vancouver Island is a high elevation plateau protecting rare plant species, undisturbed old-growth forests, fragile karst features, sinkholes and a number of small lakes. This rugged, remote and undeveloped park is extremely difficult to access, but can be reached by the adventurous through a series of logging roads. There are no developed trails in the park, but determined visitors will find a pristine forest of Sitka spruce, hemlock and cedar. Spectacular views of Clayoquot Sound can be enjoyed from the Plateau’s summit. 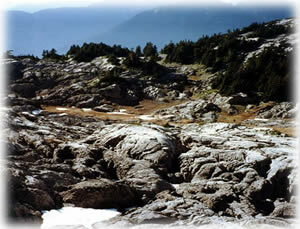 Clayoquot Plateau Provincial Park contains an extensive cave system suitable for exploration by experienced cavers only. Although there may be potential for caving opportunities in the future, this area is sensitive and its use is not recommended until a management plan is complete. Bring your own water, as potable water is not available in the park.�All surface water must be boiled, treated or filtered before consumption. Bears, wolves and cougar may be present anywherein the sound. Do not bring pets into the park. Good quality raingear is essential, even in the summer. Bring emergency equipment and spare clothing. Access is extremely difficult; there are no trails in this park. Snow melts very late in the season. The karst area is very hazardous. White-nose Syndrome is a fungal disease that has been linked to the mass die-off of hibernating bats in Eastern North America – it poses a significant threat to bats of the west and British Columbia. There is evidence that humans have accelerated the spread through entering caves with contaminated clothing, gear or equipment. To help prevent WNS from taking hold in B.C., the Province is making investments in bat conservation projects. To ensure the protection of bats and their habitat in this park, BC Parks strongly advises that personal caving gear that has been used anywhere east of the Rockies not be used in B.C. Also, before entering caves in B.C, cavers and visitors should consult the provincial WNS website, which includes a link to a Decontamination Protocol for Mines and Caves. Cultural Heritage - The park lies in the traditional territory of the Tla-o-qui-aht First Nation. The connection of the Nuu-chah-nulth First Nations peoples to this land is a vital, driving force and visitors are asked to respect this connection. Access to Indian Reserves is prohibited unless permission has been obtained from the band office. Conservation - A high elevation plateau with small lakes, the park protects a number of rare plant species, undisturbed old-growth forests, karst caves and sink holes. This park contains an extensive cave system. This is a wilderness area that is extremely difficult to access. Caves are suitable for experienced cavers only. Although there may be potential for caving opportunities in the future, this area is sensitive and its use is not recommended until a management plan is complete. Portions of this park are open to hunting for specific species. Hunters must have valid licences and tags. Please refer to current printed Hunting & Trapping Regulations Synopsis publication for closures and regulations. Visitors to the park will see a pristine old-growth forest of Sitka spruce, hemlock and cedar. Spectacular views of Clayoquot Sound can be enjoyed from the summit. While fires are allowed, we encourage visitors to conserve the environment by minimizing the use of fire and using stoves instead. If you must use a campfire, please practice “Leave No Trace” camping ethics. There are no designated campsites at this park, however random wilderness camping is allowed. No facilities are provided and there is no fee. This park is open year-round, however roads may become inaccessible due to snowfall. There is no fee for backcountry camping. Please practice “Leave No Trace” camping ethics. This park is open year-round, however roads may become inaccessible due to snowfall. There is no fee for backcountry camping. Please practice “Leave No Trace” camping ethics.